The saddlery shop owned by James Connors (1856-1940) was located on Old Dayboro Road next to the Courthouse in an area originally set aside as a “Reserve for Post and Telegraph purposes” (see Survey Plan M33.1017). It seems likely that Connors leased the area after the demise of the short-lived combined Post and Telegraph Office which operated on the site only from 1884 to 1888. Connors travelled overland from New South Wales and briefly opened a saddlery shop in Strathpine before moving his business to North Pine in 1888. 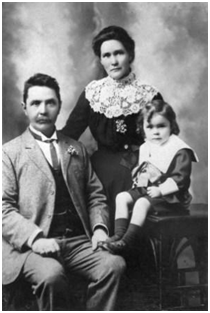 The Connors family: James, Mary Emmeline (nee Rowe) and James William. A couple of years after his 1904 marriage to Mary Emmeline Rowe, Connors purchased land in what is now known as Connors Street. It is believed that the Connors house (6 Connors Street) was built around about 1907. Connors continued operating his business until the time of his death on 26 July 1940.